← Are we Like Moths Flying Towards a Flame? Welcome to Tucson where we received two inches of snow in the desert. 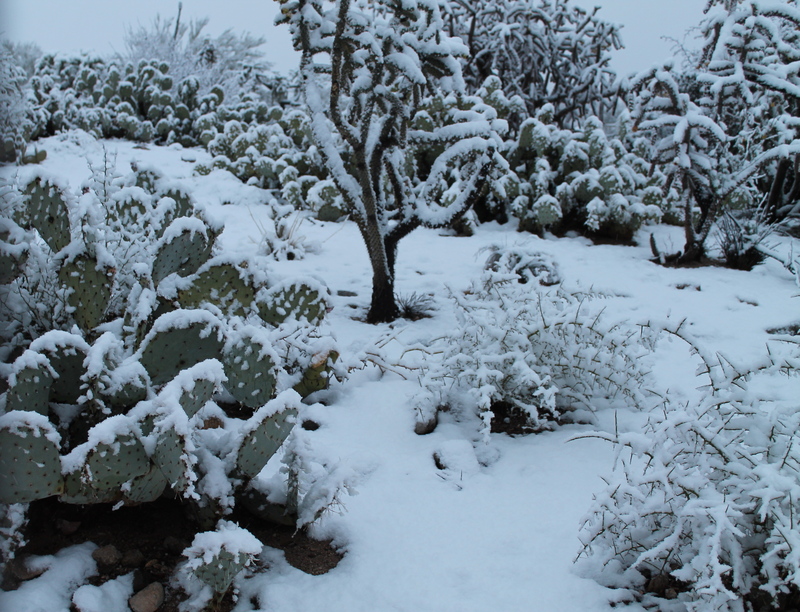 As you can see from the picture, the snow was beautiful covering the palo verde trees and the cacti. Of course by noon or so the next day, it had melted including a small snowman that I had made in our front yard! We had the privilege of going to the Richard Rohr/Laurence Freeman conference in Chicago this past weekend and running the bookstore. Many of you that frequent our facebook page, newsletter and/or our website came up and introduced yourselves so it was a wonderful way to put names with faces. This week in our newsletter we are continuing our audio study of Richard Rohr’s “A Lever and a Place to Stand.” A couple of key ideas that are covered would be how we view religion – as a punishment/reward system, a belonging system, parent/child system…. I don’t think anyone is considering all the ideas of religion to be wrong or bad – but maybe we often times use it as a crutch – a comfortable place so we don’t have to think too hard for ourselves. Hmmmm, a lot to think about. I also found an interesting article that Richard Rohr had recently written: Finding God in the Depths of Silence. Let me know what you think.